In China’s foreign relations regarding the South China Sea (SCS) Issues, Vietnam is undoubtedly one of the key countries that China has to face and need to be handled well for its overall good neighbourly relations in its regional foreign policy. Due to the ideological symmetry, China and Vietnam have more channels to work towards that direction. Top-level communications between leaders of both Communist Parties, Governments and Congresses, including the exchange of visits, are considered very important in their bilateral relations given their significance in guiding the future development across various fiends, including the most sensitive issues in the SCS. 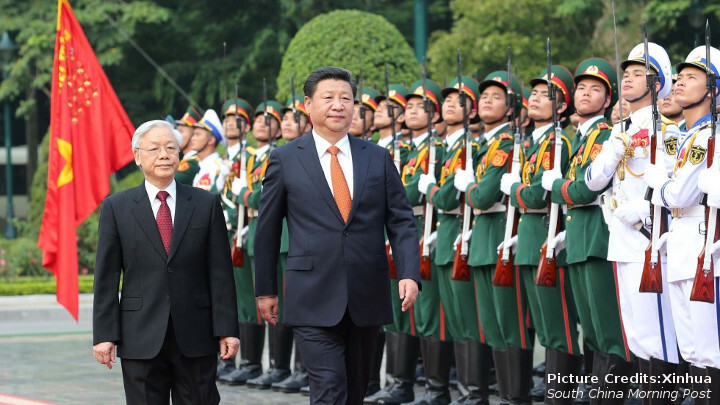 The start of 2017 in China-Vietnam relations can shed light on the bilateral approach towards the South China Sea situation. From 12 to 15 January 2017 General Secretary of Communist Party of Vietnam (CPV) Nguyen Phu Trong paid an official visit to China. Both countries attached great importance to this visit. Vietnam chose China as the first country for its Party Secretary to visit in 2017. Besides the high-ranking officials Trong’s delegation also included Vietnamese local officials with the intention to expand economic and trade cooperation between localities in both countries. This was Trong’s first visit to China after his re-election as CPV chief at the 12th CPV Congress and it took place just before the 67th anniversary of establishment of China-Vietnam diplomatic relations on 18 January. Read the full text on the China-US Focus website.